So far, Garish have been quite successful in their home country Austria, but they couldn't score over the border. They hope to make this decisive step with their third album which was produced in a more professional way. 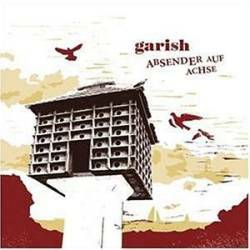 Garish are a melancholic pop band with bright ideas concerning song writing and instrumentation. Although I appreciate this kind of music in general very much, I regret that Garish's approach could be less polished. The opener Teer und Federn is so mellow that it would be perfect shopping mall background music. I prefer the more dramatic songs where at least slight parallels to Blumfeld, Radiohead or Sigur Ros can't be denied. This is the case on several songs, but best done on Unter Bäumen – Regen and the first single edit Später ist egal. A difference between Garish and many other pop bands is the use of such a variation of instruments as violins, cellos, saxophones, trumps, trombones, accordions, singing saws and even a children's choir. The talent behind Garish is obvious, but I'd prefer them playing in a slightly harder league. Everyone who likes sad and melancholic pop tunes could find some interest in Garish. Although they toured together with Tom Liwa, Germany's greatest singer/songwriter alive, they still have much work to do before reaching his level.